Extended Stay America Phoenix Airport E. Oak St. Choose the Hilton Suites Phoenix hotel - the only all-suites hotel in downtown Phoenix, Arizona. Enjoy the comforts of home in a tropical, atrium setting. 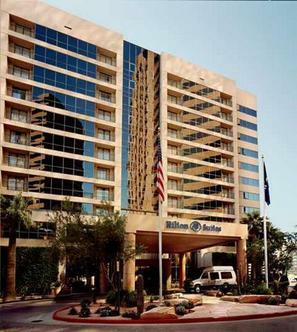 We are the closest Hilton hotel to the Phoenix Convention Center. At the Hilton Suites Phoenix hotel, luxury is yours with breathtaking fountain and city skyline views plush guest suite accommodations including our exclusive Hilton Serenity bed and bath collection plus, an optimal location in the heart of the Central Business District and near Phoenix's most popular cultural, entertainment and sports venues. Other points of interest and convenience include: Phoenix Sky Harbor International Airport (PHX), Scottsdale Municipal Airport (COS), Scottsdale Fashion Square, Biltmore Fashion Park, Old Town Scottsdale, Mill Ave. (Tempe), Phoenix International Raceway - NASCAR, Indy, Grand Am, and Copper World Classic, University of Phoenix Stadium - Arizona Cardinals (NFL), Arizona State University and the Sun Devils Stadium Jobing.com Arena (Home of the Phoenix Coyotes) NHL. The Hilton Suites Phoenix hotel is just moments away from some of Major League Baseball's spring training facilities Tempe Diablo Stadium - LA Angels, Phoenix Municipal Stadium - Oakland A's, Scottsdale Stadium - San Francisco Giants, Maryvale Baseball Park - Milwaukee Brewers, Hohokam Park - Chicago Cubs, Peoria Sports Complex - (Cactus League) - San Diego Padres and Seattle Mariners, Surprise Recreation Campus - (Cactus League) - Kansas City Royals and Texas Rangers.Click here to see moreThe Hilton Suites Phoenix is your hotel for all of your business and meeting needs. Here are some of the businesses located right outside our door. AIG, Bank of America, JP Morgan Chase, Ernst & Young, Deloitte & Touche LLP, IBM, Qwest, Microsoft, Banner Health, Catholic Healthcare West (CHW), Wells Fargo Conference Center, St. Joseph's Hospital.Click here to see more businesses in the area.The Hilton Suites Phoenix hotel offers a complimentary shuttle that will take you to nearby theaters, restaurants, shopping and sports stadiums in the Phoenix, Arizona area. Chase Field (Home of the Arizona Diamond Backs) MLB, US Airways Center (Home of the Phoenix Suns) NBA, Arizona Center, Arizona State Capitol Museum, Arizona Science Center, Heard Museum, Actors Theatre, Arizona Historical Society, Phoenix Convention Center.Please see our accommodations page to see all of the extra amenities that come with all suite night stays at the Hilton Suites Phoenix hotel. Welcome, and enjoy your stay with us.Travel should take you places.